When you paddle a tandem (double) kayak you have certain advantages and certain challenges due to the size and weight of your boat. The greater size allows more storage. More storage adds more weight to an already heavier kayak. If you were to capsize and needed assistance, the assisting paddlers will have to work harder with your larger craft as compared to a single. In some cases it may take more than one paddler to help you given the weight and design of your tandem. Some tandem kayaks do not have bulkheads, some only have bulkheads for the forward and rear storage areas, while others have bulkheads separating all compartments and cockpits. There are even some tandems that have a center cockpit for small paddlers. Given all of these differences, it is a good idea to have an assisted recovery technique that will work for the range of tandems on the market. We decided to use one of the largest tandems on the market to demonstrate this T-Recovery. The kayak is a Current Design Libra XT. This is one of the models that has a center hatch/cockpit. It does have a full set of bulkheads between each hatch and cockpit. If you choose to try an assisted recovery, instead of just climbing in and pumping out the water (See USK article, "Double Re-enter And Pump Recovery"), I recommend the T-Recovery, because I have found it the fastest and most reliable assisted recovery if you have to drain water from the tandem. The two singles approach the bow of the overturned tandem. I suggest putting the stronger of the two single paddlers closer to the bow. The one closer to the bow will be called the lifter. The job of the lifter is to get the bow of the tandem up onto their deck over their lap. The job of the second single is to stabilize the lifter and provide additional lift when needed. The paddler closer to the bow is usually the one who also orchestrates all the parties involved by calling out instructions. However, you may have a novice paddler who is very strong and a smaller, more experienced paddler as the second calling the shots. There are a number of ways to get the tandem's bow over the lifter's cockpit. In this instance, one of the swimmers is jumping on the back of the overturned tandem so it makes it easier for the lifter to lift the bow out of the water. Remember, that there is suction created by the cockpits and the water. In the case of the tandem, there are two cockpits, which makes it harder than a single. By tilting (slightly rolling) the overturned kayak, the suction seal is more easily broken. The second of the tandem paddlers, who is near the cockpits, can push up on the forward cockpit to help with the slight rolling movement. Since there will be more work in lifting the bow of the tandem, the second paddler's job is to keep the lifter from capsizing. If the lifter is fully stable, then they can commit more strength to the lifting without fear of capsizing. The second paddler can grab the lifter's cockpit or PFD to stabilize them. In this illustration the two single kayaks are facing the same way. They could also perform the same job while facing in opposite directions. Once you play with this recovery, you and your partner can decide which way works best for you. 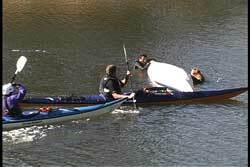 A second way to get the bow of the tandem onto the assisting kayak is with the bow slide (a future article). Have the swimmers turn the tandem upright. Then the lifter can easily take advantage of the curve of the bow to slide the kayak up over their cockpit. Once the bottom edge of the bow is on the cockpit coaming, you can roll the tandem on its side so the lifter can see the cockpits. Then the tandem can be slid over the second single cockpit. The two singles can now roll and lift the tandem to drain the water. After the bow is over the lifter's cockpit, your goal is to get the second cockpit of the tandem out of the water by moving the tandem's bow over the second paddler's cockpit. Then the two of you will need to lift the tandem to drain the water. This is assuming there is a rear bulkhead behind the second cockpit. If there were no bulkheads, I would not even attempt to try a TX Recovery (which is needed to drain water from both ends of a kayak) due to the weight of a loaded tandem. See USK article, "TX Recovery". The no bulkhead scenario would be a re-enter and pump recovery. Again, before you leave shore you should know what equipment the group has and who has bulkheads and who doesn't. As I always say, "Choose your paddling partners wisely". Trying to lift a large, fully loaded tandem can be difficult even in calm conditions. Rough water make this more challenging. 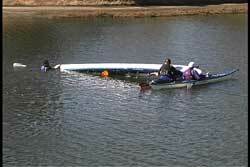 It is possible for the swimmers to help lift the bow if they hang on to the lifter's kayak. If they choose to help, they need to be cautious of the possibility that the lifter can drop the kayak if it is too heavy or they lose their grip. Deck lines on all of the kayaks allow for secure places to grip for lifting or hanging on. As you can see in the picture, you really need to lift the bow high to get that rear cockpit drained. In addition, you need to keep the cockpit from scooping water when you turn the tandem upright. That is done by keeping the bow high when you start rolling the kayak up. Once the rear cockpit is clear from scooping water, you can begin to lower the kayak back into the water. This could be a good time to think about a tandem assisting a tandem. 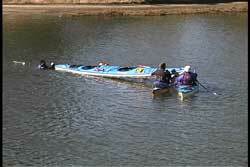 If the assisting kayak were a tandem then there could only be one lifter in the kayak. 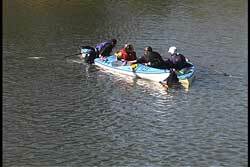 The second paddler could stabilize the assisting tandem with a sculling brace or use their paddle float as an outrigger. If the capsized tandem was heavy, then the swimmers help may be the only way to lift the flooded tandem to get the water out. When the water is drained and the tandem is upright, you can slide the tandem back into the water. It is the responsibility of the lifter to maintain constant contact with the tandem. A good grab loop or deck lines are helpful. Your next step is to get into a position where you can stabilize the tandem so the first swimmer can get back into the tandem. The lifter would be the one to first stabilize the tandem. If they need additional help the second single can aid them. While holding the bow it is easy to spin your kayak around so you can end up in the stabilizing position. In this example I held the deck lines in front of the front cockpit. The swimmer was between me and the tandem. I maintain my hold until the first swimmer is back in the kayak. The second paddle was next to me to keep me stable. I didn't need his help because I was fully supported by the tandem. 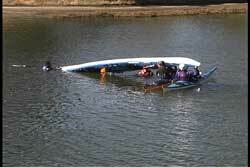 Given the buoyancy of a tandem (even a single kayak) it is almost impossible to capsize if you commit to resting on the kayak as you stabilize it. If the second single needs something to do, they can always collect any equipment that might have drifted away once we are in this phase of the recovery process. The second swimmer should only enter after the first one is fully in their seat and indicates they are ready. If the person stabilizing the kayak is strong and has a good grip, then both swimmers could try to get in at the same time. It really is a judgment call to be made at the time. 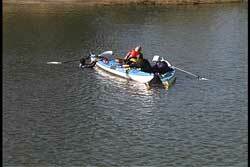 My preference is one at a time because it is easier on the paddler stabilizing the tandem. The order of entry really isn't too important unless there are specific issues such as exposure. The colder of the two swimmers should be the first one to get back in. If there is a very weak swimmer and you didn't have a stirrup, the second swimmer could help boost the first one in. The second single could also get into a position on the opposite side of a weak paddler to help pull them up onto the deck of the tandem. As always, it is good to make sure that the once capsized kayak is seaworthy before you take off. More importantly, you should make sure the paddlers are also sea worthy. See USK article, "Sea Worthy". When everyone has communicated their readiness and have agreed upon what to do next, that is when the recovery is over. I think it is important to take some time after an unplanned capsize to gather oneself. Time may be needed to change clothes or take an energy break. It also may be a good time to change plans if the conditions are not what the group expected. 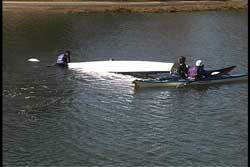 Capsizes usually occur when the conditions take a turn for the worst. Given the numerous options there are with respect to tandem design it is difficult to give one technique that will work with all the different tandems. However, the technique I have described has worked with one of the largest tandems on the market while it was loaded. If all else fails the re-enter and pump recovery, as referenced at the beginning of the article, is a solid recovery that works with all kayaks as long as a pump is available. If we had to perform the re-enter and pump with this large kayak, we could have four pumps working at once. 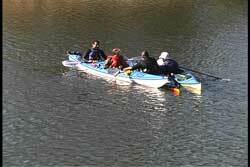 Each single should have a pump and each paddler in the tandem should have their own pump and paddle float. It is important to not injure yourself when performing recoveries. Given the possible weight of a loaded tandem don't strain yourself by trying to drain the water. If you try to lift the flooded tandem and it is too hard, change your plans and try another recovery.